What’s the Biggest Challenge for Rearing Beetles and Flies? By now, if you’ve been following the news from our lab here at Cornell, you’re familiar with our biocontrol species. Our beetles (Laricobius nigrinus) and our silver flies (Leucopis argenticolis and Le. piniperda) are predators of HWA, and our lab team works hard to rear them in the lab until they can be released at sites throughout New York. For beetles, this involves keeping the colony healthy by replacing old hemlock foliage and rotating through clean jars on a weekly basis. For flies, this means closely monitoring egg-hatching from Pacific Northwest foliage and collecting adults for prompt release. The limiting factor, in both cases, isn’t time or number of hands at work–it’s bug food. Keeping our predators happy is synonymous with keeping them fed. Without HWA-infested hemlock branches coming into the lab regularly, there are no predator colonies. What makes our HWA predators such great biocontrols is the fact that they specifically eat HWA, but that also means that we have no safety net. If we can’t find HWA to feed our beetles and silver flies, then we won’t have predators. There is no secret to collecting food. We visit infested sites (with permission from our partnering land owners, of course!) and collect as much foliage as we can. Once the collected hemlock branches are back in the lab they are preserved in buckets of water and kept at a low temperature to slow the development of HWA. Beetles receive hemlock foliage “bouquets”, hemlock twigs placed upright in floral foam and clumped together to provide the feel of a dense hemlock stand. These bouquets get changed out week after week, refreshing the available food source for the beetles. For flies, collecting and sending full branches from the Pacific Northwest assures that food arrives with them. As flies hatch from those infested branches, they are collected and processed for release. 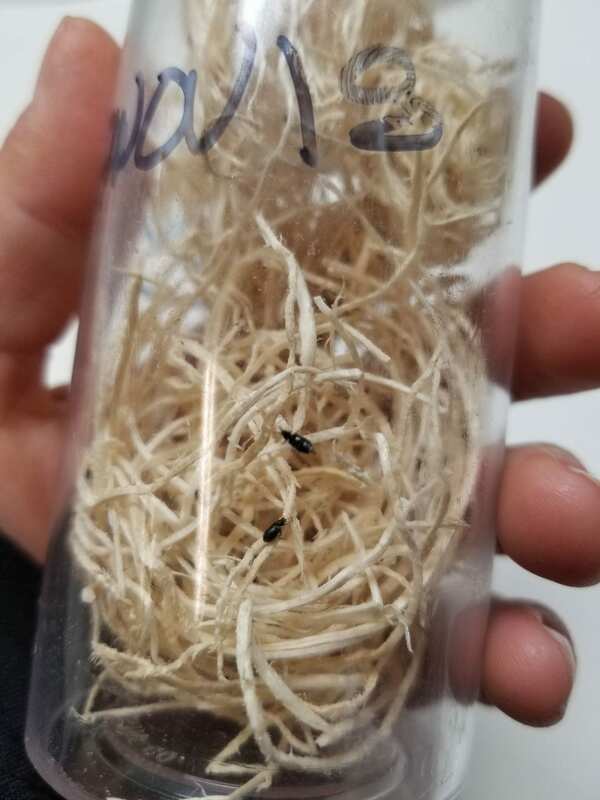 This year we reared flies in the lab to the second generation, but continuing this process will rely on our ability to provide flies with HWA that is actively laying eggs on which silver fly larvae feed. The success of our biocontrol program relies upon, and will continue to rely upon, the availability of HWA-infested foliage to keep our bugs growing up strong and healthy. Fatter, more robust biocontrols will be poised for survival in the field, and will make our goal of long-term HWA management that much more attainable. If you have infested hemlocks on your property, you can make sure those HWA go to good use! 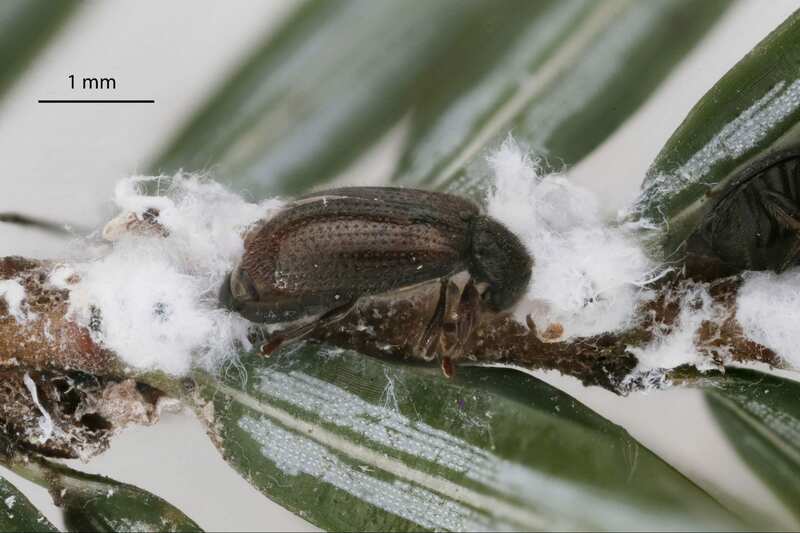 We are always looking for landowners to provide our lab with food resources for our biocontrol bugs. Email us at nyshemlockinitiative@cornell.edu to learn more. NYSHI Spring Newsletter Out Now!